Most people think that implantation is a lengthy and serious procedure full of possible complications. Fortunately, this is not the case: it is a routine and pain free surgical intervention and its success rate is 98%. Find out more about the steps of the treatment now. Implantation is elective, is planned beforehand so it the preparations are very important. As the dentist conducts the treatment under local anaesthesia the patient does not feel any pain during the treatment. The dentist then opens the gum where the tooth loss occurred making the bone available for implantation (this is the so-called transgingival method). The next step is determining the place, length and direction of the implant with a starter drill (a leading channel drill). After that the dentist makes a hole in the bone that suits the implant perfectly. In some cases this hole can be made in a screw thread shape but it is not the screw thread that will be the stable foundation for the implant but the connection of the bone and the implant together. The implant is then inserted and it is already stable in the bone (primer stability). 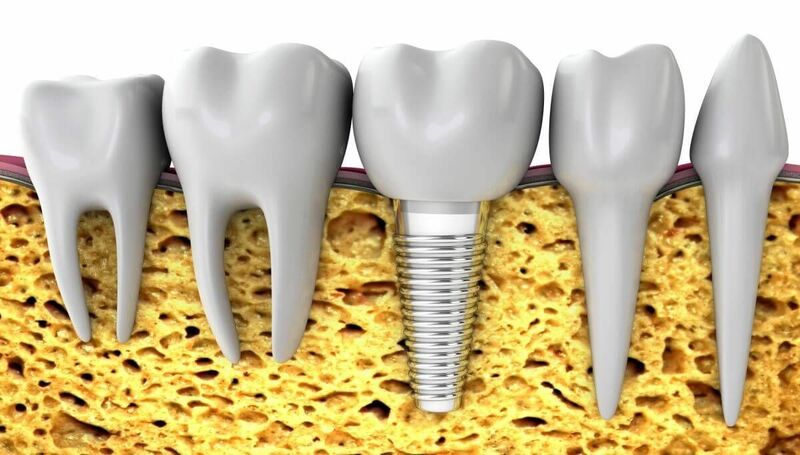 The role of primer stability is to make a tight connection between the implant and the bone during the healing period. After that the dentist placed a healing screw in the implant which will stay there until the bone integration (osseointegration) is complete. Osseointegration (or bone integration) is the process when the inserted implant and the bone structure (the existing bone) fuse together. This will be the stable foundation for the implant. This connection helps the chewing force to be placed on the bone from the implant. During the healing period the tissues need to rest so the dentist stitched the cut. It takes 3-4 months until the osseointegration is complete so the implant is safe in the parodontium. Three to six months later there is a stable connection between the bone and the implant that is enough to bear a crown. During the second occasion the dentist opens the gum again, removes the healing screw and places an abutment on the implant. The easiest way to imagine an abutment is to think about a tooth that is filed down for a crown or bridge ( it is ‘cap shaped’). The stable connection between the implant and the abutment is guaranteed by the temporary screw. Then comes the impression of the abutment and its surroundings that is taken by the dentist. Based on this impression the dental lab creates the crown (3-5 days). After preparing the permanent crown the dentist fits it onto the abutment with a special glue. The dentist gives all the instructions regarding the cleaning and healing process. If the patient follows the instructions and attends the after-care check-ups he/she can almost make sure that the implantation will be a lifetime solution. Regardless of how many teeth you are missing, implants offer a permanent means of replacing them, improving chewing ability, boosting self-esteem and much more besides. Even if you’ve been refused implant treatment in the past, our implant specialists drawing upon the range of available implant systems will provide you with the solution best suited to you. Send us your OPG X-ray or ask for a consultation appointment!